Thrift stores across the United States have been inundated with donations in the wake of Netflix’s January 2019 release of “Tidying Up,” a series starring Marie Kondo, professional organizer and author of The Life Changing Magic of Tidying Up. The premise is simple: She wants you to identify and remove all items in your home that do not “spark joy.” The items are thanked for their service before hitting the curb or the donation box. After tidying your home according to her methods, Kondo promises, it will stay organized forever. “If you adopt this approach — the KonMari Method — you’ll never revert to clutter again,” she writes in her book. But is tidying really that beneficial to well-being? Journalist’s Resource has surfaced research that addresses that question, ranging from an article that looks specifically at the KonMari method to a study that looks at decluttering as a method to mitigate bedbug infestations in a low-income apartment complex. That study, among others, indicates that beyond sapping joy, clutter is a public health problem. We hope this collection of research sparks joy (and story ideas). Lee, Hsin-Hsuan Meg. Advances in Consumer Research, 2017. The author of this short research article conducted in-depth interviews with 11 women who had used the KonMari method in some way. All participants had documented their efforts with pictures, videos, diaries or blog posts. Six of the participants were “pure KonMari converts who faithfully followed all steps in the method.” The remaining five adjusted the method to their needs or did not execute it fully. The researcher asked the participants about their experience with the KonMari method. Many participants found it difficult to treat their objects as animate in some way — e.g., thanking the object for its service. Many participants thought it was easier to determine what to discard than what to keep. Some found the process of discarding items that do not spark joy to be the “best part” of the process. Roster, Catherine A.; et al. Journal of Environmental Psychology, June 2016. This research hypothesizes that clutter might prevent people from reaping the benefits of having a home – a place commonly associated with comfort and security. The study surveyed 1,489 residents of the U.S. and Canada on the relationship between clutter, personal well-being, and attachment to one’s home and possessions. “The population of interest was adults with mild to severe issues with clutter,” the authors write. The survey participants were found with assistance from the Institute for Challenging Disorganization (ICD), a non-profit that helps “chronically disorganized” people through education and research. Those in need of assistance “range from mild, situational disorganization due to relocation or other temporary life disruptions to chronic disorganization arising from compulsive hoarding, ADHD [attention-deficit/hyperactivity disorder], brain injury, and physical impairments associated with aging.” The survey was posted on the ICD’s website and disseminated by ICD-affiliated professional organizers. In this study of dual-income, middle-class families in a large U.S. city, 30 heterosexual couples gave tours of their homes, and recorded the tours via camcorder. Researchers used linguistic analysis software to calculate the frequency of various words participants used to describe their homes — focusing on words that indicated clutter, an unfinished state of the home, or a restorative or natural place. Four times a day for a week, the couples filled out reports about their moods and provided saliva samples, used to measure their cortisol levels. Cortisol is a hormone that regulates many bodily processes, such as metabolism and blood sugar modulation. People who have low cortisol levels — or do not experience the normal decline in cortisol levels that occurs over the course of the day — tend to have greater stress and other negative health outcomes. A lower-than-normal change in daily cortisone levels is an indicator of chronic stress, the researchers explain. The researchers analyzed the data for links between the participants’ environments and their moods and changes in cortisol levels. Women who described their homes in more stressful terms — e.g., as messy, cluttered, disarrayed, unorganized, disorganized, overflowing, chaotic, haphazard, unfinished, half-finished or sloppy — experienced below-normal changes in cortisol levels. Women who described their homes with more restorative terms — e.g., as relaxing, restful, calming, comforting, soothing, serene, pleasurable, quiet, homey, or peaceful — had sharper changes in cortisol levels, indicative of greater psychological and physical well-being. Additionally, women who felt their homes were more stressful tended to report experiencing depressed mood as the day went on, whereas women who described their homes in restorative terms were less likely to report depressed mood. Ferrari, Joseph R.; et al. Current Psychology, June 2018. This study looks at the relationship between procrastination and clutter. “It is possible that procrastination tendencies relate to high levels of clutter, because the procrastinator never takes the time to discard or fails to decide what items to keep,” the authors hypothesize. “Understanding the role of possessions for procrastinators provides some insight into the ecological lifestyle of this maladaptive pattern for many adults. Compared to non-procrastinators, do procrastinators more or less identify with their possessions, with certain places, like their home; do procrastinators perceive their sense of home?” To this end, 346 students from a large, Midwestern private university participated in an anonymous survey with questions about how prone they were to procrastination and how cluttered their dwellings were. Three “clutter variables” were associated with procrastination — ineffective use of one’s living space; feeling overwhelmed, depressed and worried by excessive stuff; and negative impacts of stuff on social interactions. Kilroy-Marac, Katie. Cultural Anthropology, August 2016. “A seemingly simple question had led me to seek out and talk to POs [professional organizers] in Toronto: how, in North America and at this particular historical moment, are we to manage and be with our ever-expanding world of material things?” the author of this study writes. The anthropological research incorporates interviews and fieldwork with 21 personal organizers in Toronto and Ontario. Personal organizers help with “chronic disorganization,” which they describe as “a behavior set or an orientation toward stuff that makes it difficult for those who experience its symptoms to keep their material possessions in order.” The services come at a steep hourly rate — major projects can cost thousands of dollars to complete, according to Angie’s List, a website that collects ratings of service providers. The author writes that while people might think of personal organizers in terms of “rational, disenchanted order of object management,” they are actually closer to healers. “The organizers fully recognize the complex ways that people become attached to, intermingled with, and even dispersed in things, and their work requires them to regularly plunge into and manipulate this world of ‘vibrant matter,’” the author writes. Personal organizers tended to use two different techniques to help clients part with their possessions. “Interestingly, these techniques seem to work in opposite directions but toward the similar end goal of ‘letting go,’” the author writes. Lauster, Nathanael; et al. Housing Studies, July 2016. This study analyzes clutter from a housing policy angle, looking at the issue of residential clutter as identified by housing inspectors. The researchers used Vancouver as a case study and focused on clutter in single-room occupancy, low-income housing – small, one-room dwellings in large multi-tenant buildings. For the Vancouver case study, the authors analyzed two sets of records from municipal inspectors. The first set includes reports from 2009 to 2012 conducted across 83 buildings, totaling 4,312 room inspections. The second set of inspections occurred between 2012 and 2013 across 109 buildings, totaling 4,460 room inspections. This figure exceeds previous estimates of problematic clutter in social housing. The authors write that published prevalence estimates of hoarding as a disorder in the general population range from 2 to 5.8 percent. “Within buildings, levels of clutter tended to remain relatively stable — through time, across multiple inspectors, and using different inspection methods. This suggests that underlying levels of clutter tend to persist in ‘problem’ buildings independently of the subjective judgments of inspectors,” the authors write. “The persistence of clutter also likely speaks to differences in building management styles. Non-profits attempting to run social housing in such a way to provide supportive environments often pursue evictions as a last resort. As a result, they likely retain more residents who accumulate residential clutter, behavior that, in private settings, would more likely lead to eviction.” Various non-profit organizations in Vancouver work to develop housing projects for low-income residents, driven by a variety of missions, including social justice, Christian charity and advocacy for people with mental illness and/or addiction. The authors add that stable levels of clutter within particular buildings “is also probably related to the intractability of hoarding as a disorder at the individual level” — in other words, the buildings stay cluttered because the residents who live inside maintain high levels of clutter within their individual dwellings. Large buildings also tended to have more problems with clutter. “To the extent that managers pay less attention to their residents, whether due to size or laissez-faire policies, they may enable more clutter to accumulate,” the authors add. Singh, Narinderpal; et al. Insects, July 2017. While insecticides are commonly used to eradicate bed bug infestations, this study sought to determine whether bed bugs could be eliminated with minimal or no insecticide — by reducing clutter, instead. This study, which ran from May to December 2014, tested varying bed bug control methods in high-rise apartment buildings in Irvington, New Jersey run by the Irvington Housing Authority and occupied by seniors or disabled residents. A total of 409 apartments were included in the sample. To begin with, the apartments in the study were not excessively cluttered. The researchers asked residents to reduce the clutter they did have and launder their bed linens frequently. Three groups of residents used chemical treatments to control bed bugs. A fourth group used non-chemical strategies: removing bed bugs by hand, killing them using steam treatment, installing bed bug-proof mattress encasements, washing bed linens, removing or reducing clutter, installing traps under the legs of furniture and killing any visible bed bugs during biweekly follow-up visits. Branas, Charles C.; et al. Proceedings of the National Academy of Sciences, March 2018. What are the effects of tidying up on a grander scale — for example, clearing and sprucing vacant lots? The objective of this study was to determine whether such efforts might reduce violence, crime and fear in a community, testing this through an experiment conducted with 541 randomly sampled vacant lots in Philadelphia. The lots were randomly assigned into treatment and control groups. The control group consisted of 166 lots, which were left unchanged. The main treatment group consisted of 201 lots, which received “cleaning and greening” efforts — trash and debris were removed, grass and trees were planted, and low, wooden fences were placed around the perimeter. The authors note that local landscape contractors executed the efforts. A secondary treatment group of 174 lots received only cleaning. In all neighborhoods, perceptions of crime among people who lived near the cleaned and greened lots decreased by 36.8 percent. According to police-reported data, across all neighborhoods, all crimes declined by 4.2 percent, gun assaults declined by 2.7 percent, and burglaries declined by 6.3 percent. 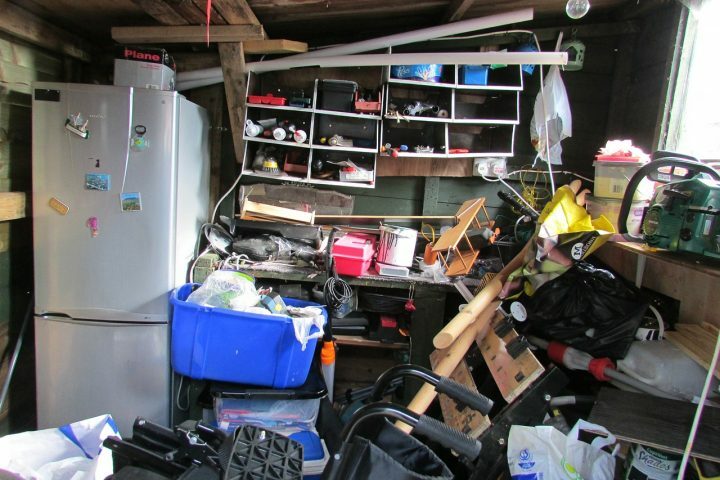 The Institute for Challenging Disorganization offers research and resources, including the Clutter-Hoarding Scale. The National Association of Productivity and Organizing Professionals can help you locate a nearby expert. A number of support groups exist for people dealing with clutter (or for coping with family members who are hoarders). Journalist’s Resource has research roundups on animal hoarding and abandoned buildings.